If you are an avid reader of books – paperbacks, hardbacks of any kind, an eBook reader is likely something you will eventually use. It just makes sense for reasons we’ll point out below. If you are a frequent traveler an eBook reader can make your packing more compact. The eReaders we’ll cover here are all small and lightweight and can pack in multiple books and periodicals into that one device. If you live away from a bookstore, an eBook reader with wireless delivery can make sense. Purchase and obtain a book in an instant without traveling to a bookstore. You like the concept of a dictionary available at the press of a button – look up a word while reading etc. You’re looking for ways to save money on your books you might be able to figure out a way to justify an eBook reader, but most of the time it is NOT cheaper than buying paperbacks and/or using the library. It just isn’t. So don’t go with an eBook reader thinking you’ll save money cause it will take quite a long time to make that payoff work. eBook readers these days are expensive so keep that in mind. You have an affinity to that “dead tree” book smell and feel. I think most who use one of these eBook readers would get over this one very quickly as they are easy to hold, comfortable to use for long time periods and very easy on the eyes. But some just can’t get past the change away from paper. Your concerned about DRM – There are certainly many DRM-free options for eBook readers out there, but they aren’t as easy as the DRM-walled eBook stores at Amazon, Sony and B&N. This doesn’t bother me for the most part, but its something to consider. There are more pros and cons, but honestly those are the biggest ones given todays eBook market. My wife who is an avid reader uses her Kindle daily and swears by it now. I’m in the market for one although I don’t read books nearly as much as she does. My dad who lives quite a ways out of town finds the wireless delivery and access to an entire bookstore at his fingertips a great feature as well as the ability to change the font size with a press of the button. Major Presence – won’t go out of business etc. 1. Sony 3G Daily Edition – This is Sony’s entry into the 3G-capable eBook Reader. It looks nice and Sony has their own eBook store, but for me this is the least promising of the three options we’re highlighting. I say that because it’s starting price is $399! Yep even more expensive than its Kindle & Nook competition. and the book prices in the Sony store are higher than the Amazon store with fewer books available. They do have Sony’s free google books available as well as access to “free library eBooks.” The screen is slightly larger than the Kindle and there’s no keyboard. You can pre-order one of these puppies, but they won’t guarantee delivery by Christmas. So be sure your prepared for that. 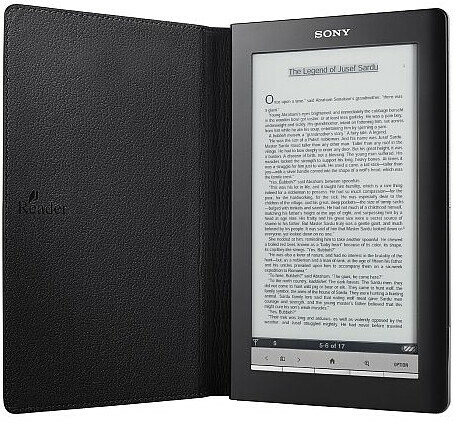 You can get a a Sony Reader with one free accessory (under $30) through 11/30. So are you getting an eBook reader this Holiday season? If so, which one?